Apple macOS Sierra 10.12 – What’s new? If you missed Apple’s WWDC 2016 keynote, then you probably didn’t catch that Apple renamed it’s OS X operating system. From now on every new version will be referred to as macOS. 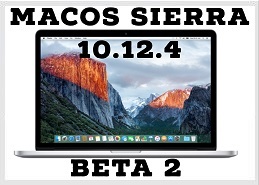 The current version is called Sierra and the version number is 10.12. Also Apple replaced its HFS+ filesystem with APFS and according to the company “APFS is optimized for Flash/SSD storage, and engineered with encryption as a primary feature”. Just go to the App Store and have a look at the available updates. macOS Sierra should be there. Before you upgrade, make sure you backed up all your important files. The most pleasant surprise is Siri on your Mac. Apple decided that it’s time Siri made the jump to your laptop or desktop. It comes with its own icon in the Dock and you can also access it from the upper right corner. What can it do? Same things as on your phone, plus search for very specific documents on your computer. In this case don’t expect an app, rather Apple Pay will be available on your Mac with the help of your iPhone and it’s Touch ID capability. When you want to purchase an item and your preferred payment of choice is Apple Pay, all you have to do is use your fingerprint and you paid for that item. It’s that easy. Apple Watch is good for a lot of things, but have you thought it could unlock your computer, just by being near it? Quite useful if you’re in a hurry. It can save you a few keystrokes, therefore you have another reason to buy it. Universal Clipboard is an awesome feature I’m sure many of you will appreciate. There are apps that allow you to copy and paste form your phone to your Mac, but starting with iOS 10 and macOS Sierra all of that is done out of the box. Just copy a text and paste it on your computer. Another great productivity feature is Picture-in-picture. If you remember not long ago I told you about Helium, again a separate app that did just that. From now on, you don’t need an app for that. Just press on the corner of the (YouTube) video and it will pop out, staying on top of all your apps. iCloud Drive’s feature has been extended to your desktop, because let’s face it, you probably keep some files there that you would like to sync to the cloud, but you are lazy to move them to another folder.